Once you complete the collection for the first time you will be able to place diving boards in your pools at home to complete the hobby there. After the time has passed come back and click the exclamation mark above your sims head to find one of the diving medal collectibles. Every time you complete one of the options above your diving hobby skill level up percentage will increase, once you reach 100% you will level up, there are 6 levels. You need to reach level 6 to be able to unlock all of the diving medal collectibles, once unlocked you will be able to find them. For example, you would need to do the 12 hour option 4 times to reach level 6. Master Fancy Flip and Twist and Poseidon are now unlocked in the hobby collection. Hello !! Hermione here again!! Sorry to bother u again but my two Sims have been diving for 3 months doing a disciplined dive (12 hrs- wait u probs already knew that!!!) And are on level 6. 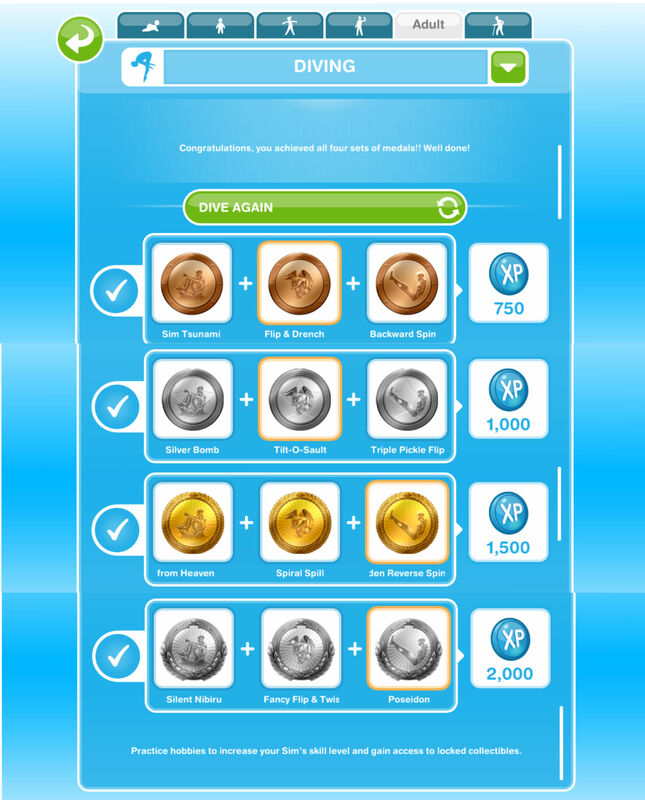 They have lots more medals that they can get, but they are constantly getting the same ones like sim tsunami… is there any way to speed this up? Okay thanx, my woodworking Sims and figure skating Sims have unlocked everything and are both on their 6-7 collection, every time It takes me longer and longer to. Complete them… is it the same with diving, should I just keep going? With the most recent update, I keep getting the lifeguard chair prize, but have no idea what it does or where it goes. It doesn’t seem to be in the home store… Do you know what the lifeguard chair prize is? Is it worth the work? I was getting 3 LPs before the update, but now it’s just the chair every time. The lifeguard chair is in the garden section under pool items but I don’t know why you keep getting it, you should get it once, this sounds like a glitch! Hi again. I’m looking for your opinion, once again. My quest requires doing a Triple Pickle Flip using a diving board in a neighboring town. I have two divers that are qualified to do it. One is an adult, one is a pre-teen. (Both have done one in the past and are above level 3). In your opinion do any of the following make any difference getting it done quicker? I’m on day two, mostly using the 10 minute and one hour dives. Should I use the pre-teen or the adult? Should I use the community pool or one at a house? Should I try the longer dive times? Any other options? And how long do you usually give it until you skip it with LPs? Skipping tasks brings me to another question. I’m almost done with “Sous Judgmental” and I need a toddler to make mud pies. I was going to skip that one, since my toddler is now a pre-teen. I do have a brand new baby, so I can grow him. But my question is, there is no option to skip the task. I’ve not seen that before, but I rarely look, because I do 98% of the tasks, that’s the fun of playing. Is it common to not be able to skip tasks? Hello again, I would just do the 10 minute option over and over again until you get it, longer options aren’t going to help you find it quickly, it doesn’t matter what sim you use, I would probably use a preteen though as the adult can do something else like gardening to make money and I would do it at a neighbours house. And the time before you skip it really depends on how patient you are or how many LPs you have, I would probably give it a full day of trying before giving up as I am not very patient! Yes it is common you can’t skip tasks for quests, you can only skip on social tasks and weekly tasks. Looking for your opinion – is it worth restarting a hobby? I’m using 4 divers simultaneously to rack up LPs from the medal collection, but once they reach maximum level it might make sense to restart them at level 1 to also collect all the levelling up prizes again. I’m guessing that taking up another hobby temporarily would then let me come back to diving at level 1. Levelling up also seems to increase town value so if I abandon a hobby I wonder if my town would lose value? I have two preteens and one adult on diving and my adult is on level 3 and my preteens are on level 1. Last night the preteens were about %90 through level one and leveled up. This morning they were %4 through level one but are achieving level two medals! There is a problem with the hobby bar, it isnt increasing correctly but as your sims can still level up they can still do the hobby. You are amazing this really helped! Finished the diving hobby, bought a diving board for a Sim home pool. The base won’t layer on the tile, it goes on the grass leaving just the tip of the board over the pool water. What is the trick to installing the diving board properly? Hope you know the solution to this problem. Your blog is fantastic! I so appreciate all the time you must have put in compiling all this information. I have added a picture of how the diving board should be placed in this post: https://thegirlwhogames.wordpress.com/2014/09/21/the-sims-freeplay-adding-a-pool/ I thought a picture might be better than me trying to explain it! Thanks so much. Now I get it. Guess a picture really is worth 1,000 words. How much does the lifeguard chair cost? Whenever I try and make my sim dive its saying that it can’t do the task even though nothing is surrounding the diving board to stop it from doing the task. Any help? Strange, all I can suggest really is trial and error, moving the diving board around until it is in a spot where your sim will use it, sorry! I have to perform the triple pickle flip in a neighbours town, can this be done in the swimming centre of a neighbours town? I don’t remember if I finished this quest on time before but if you did finish this on time, are the diving boards free? Bc on my sims, it costs LPs. I wanted to buy diving boards for my pool bc I want my sims to do their diving in my hobby house instead of doing it in the swimcenter. And the diving boards I need to buy costs LPs but they’re all only rated one star, why is that? You must have completed this hobby if you have diving boards in your store but they aren’t free. Can I use the lucky spin to get all of the medals? Yes you can but that will cost you a lot of LPs. how can I get 3 stars diving boards? There must be such, right? All diving boards are one star as it is a hobby so the times cannot really vary depending on the star rating.